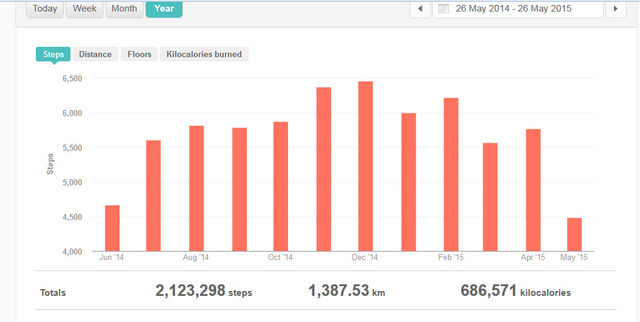 I bought a Fitbit Flex last year and it arrived on 26 May 2014. Here’s where I wrote about using it after the first seven weeks. I’m still wearing it all the time except when I shower. The band is easy to attach now that I’m used to it. I love tracking my water. Our medical aid rewards us with 100 points a day if we hit between 7500 and 10 000 steps which does push to get to 7500 some days. They also reward us with 50 points if we get between 5000 and 7499. Sadly I only discovered this in the last two weeks otherwise I would have been pushing myself to at least 5000 some days. Yep, I don’t even hit 5000 when I have lots of meetings and TONS of work. My daily step average over the year is only 5800 steps. That sounds about right because I average 6000 – 6500 in summer and 5000 – 5500 in winter. Saturdays are my highest step days of the entire week – always… because of my Zumba class and pottering around the house, tidying, sorting, etc. I am not in the least motivated to compete with others. Some friends have invited me to challenges and I’m just not interested (maybe I have some Rebel in me?). Many friends have become runners over the last year and to be honest, seeing 17 000 steps at 7 am in the morning just demotivates me when I have 170. I still maintain that you can’t get to the 10 000 steps unless you’re consciously going for a run or long walk daily IF you have a desk-bound job. I’ve seen suggestions that you walk around every 30 minutes or so and trust me, I’m quite energetic so I do get up and go to the loo, make tea, go see someone about something instead of emailing, but the fact is I have to sit at my desk and work to actually do my job. This is not an excuse but I prefer to not take a full lunch and leave a little earlier than use up a lunch time to go walking outside in the heat and have to stay later. I have to get home so our nanny can leave. Two Fitbit bands have broken during the year, and Dion’s also had his one break. The bands get very dirty despite washing them. Despite all of that, I still love my Fitbit and I’m actually going to set mini goals again from June to at least get 5000 steps a day. Do you have a Fitbit? What do you love? What’s proving challenging for you? 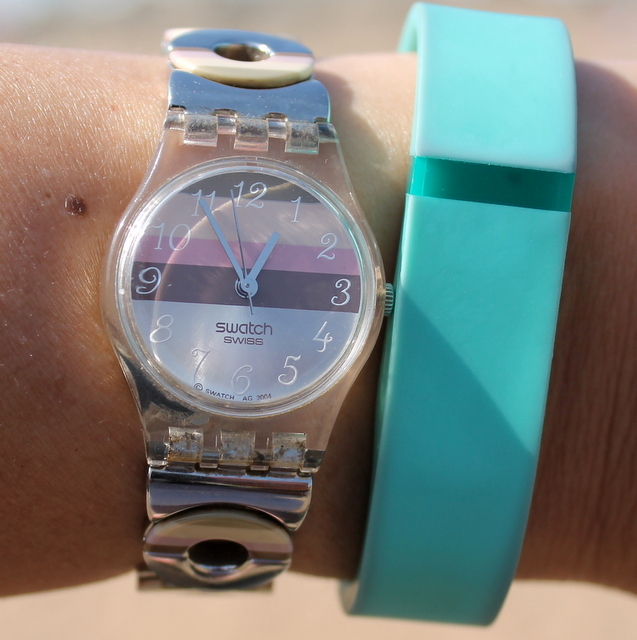 I can’t seem to figure out how to use it to track my exercise so I’ve given up on that part of gadget. Really you get bonus points for 5000-7500 I didn’t know that! Interesting. I finally figured out how to use it track my exercise!!! Yay! I also have a Fitbit since last Christmas 2014. Mine is the cheaper model that clips to my pocket and I love wearing it there. Also I have to push to get over 5,000 steps a day but occasionally I do get over 7,000 to 8,000. I have never gone 10,000 steps and I goal is to at least once reach that amount. I have a few friends and I never get over their steps but it is a challenge to try. I also like the sleep feature. Enjoy your Fitbit.